He's had an impressive winter - now Chris Jordan is out to have a summer to savour with Sussex and England. The 30-year-old is in a purple patch in his career - he was named man of the series in England’s 3-0 T20 whitewash over the West Indies last month, taking 4-6 in the second match in Basseterre. Jordan, who has taken 43 international T20 wickets in 31 games, also featured in T20 tournaments in Australia, Pakistan, and New Zealand. As he gets back to domestic action with Sussex, Jordan said: “It’s been a good winter. It started with the T20 in Sri Lanka, then the T10; then I went to New Zealand, and then the Big Bash; then PSL and back with England; so it’s been a whirlwind but a good winter. It was a mixed campaign last season for Sussex as they finished runners-up in last year’s T20 Blast finals day, falling at the final hurdle to Worcestershire. The Sharks finished third in the Division Two County Championship, and failed to make the knockout stages in the One Day Cup. Jordan played down any tangible targets ahead of the new season, adding: “The priority is focusing on one day at a time, and one game at a time. As fun as it might sound, we did that for a long period last season and look where we ended up. 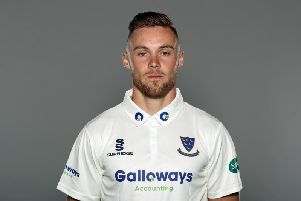 Along with signing a contract extension with Sussex last week, Jordan has his attention on starting the season on home soil instead of starring in this year’s Indian Premier League. It has paid off so far, taking 5-53 against Cardiff MCCU. The Barbadian-born all-rounder has played in previous editions of the IPL, featuring for the Royal Challengers Bangalore and the Sunrisers Hyderabad. Jordan spoke of the difficulty of playing on the T20 franchise circuit. He added: “First and foremost, any time you go to play those leagues, you are going as an overseas player so expectations are high straight away as soon as you walk on. "You try to get your performance levels up to a standard straight away and I think that helps in terms of bringing out the best in yourself. As an overseas, you’re not just another member of the team, people are looking to you to make a difference in games and produce the best possible results. 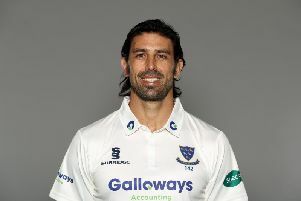 “I’m going to be staying with Sussex for the near future anyway. I think it will be good for me to start the season here. I had a good game last game against the university, so hopefully I can build on that performance.